I’ve been sorting through a whole load of storage crates over the past few weeks, some of which have been undisturbed for 13 years or more. Inevitably some of the contents prompt a certain sting of nostalgia: in a few cases I can recall the precise circumstances in which I acquired a particular book or record, or wrote or drew something. But I’m also coming across things that push no buttons whatsoever, even if I feel they ought to. 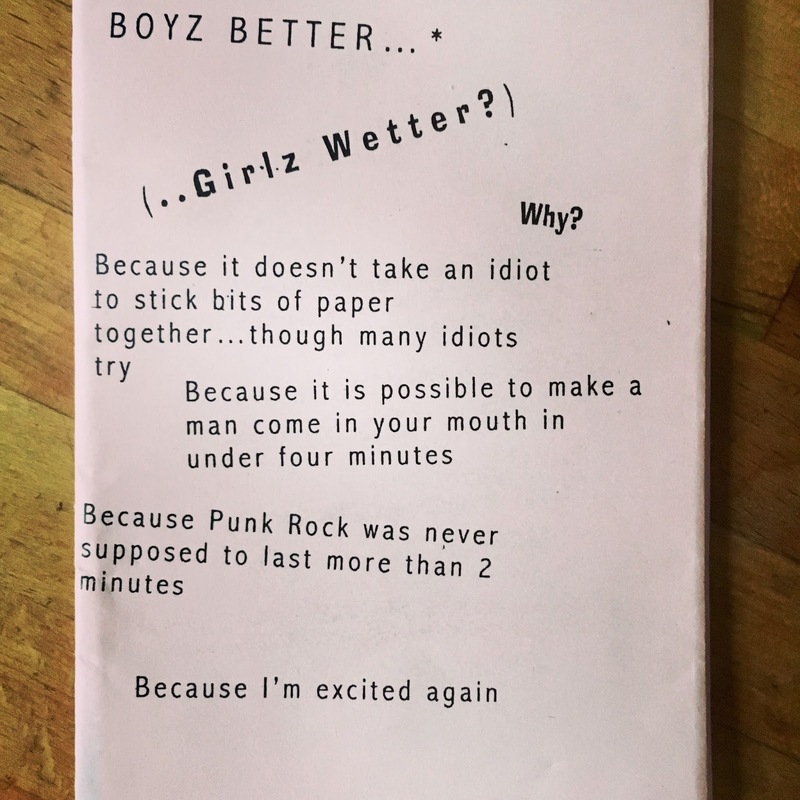 One such example is this copy of the fanzine Girlz Wetter. 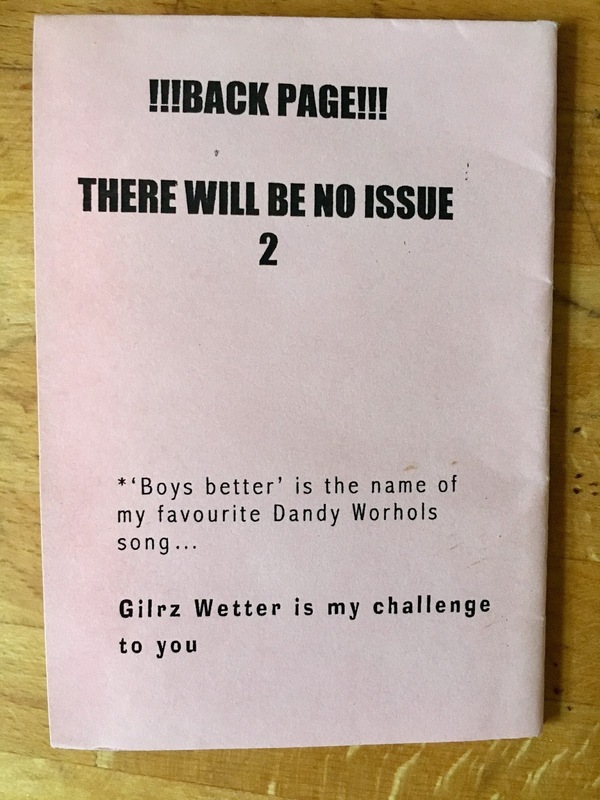 Although maybe calling it a fanzine is to overstate its significance. 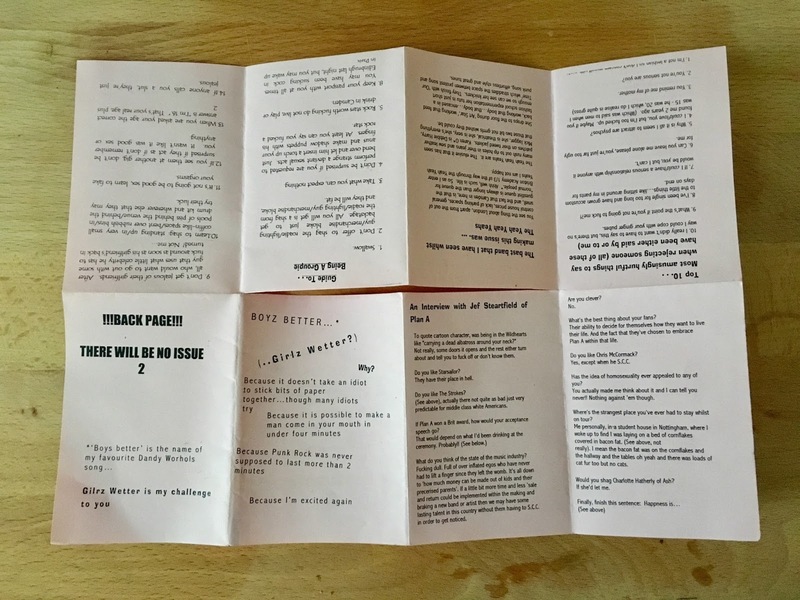 It’s a single A4 sheet of pink paper, folded into a pamphlet tiny enough to fit in your wallet. 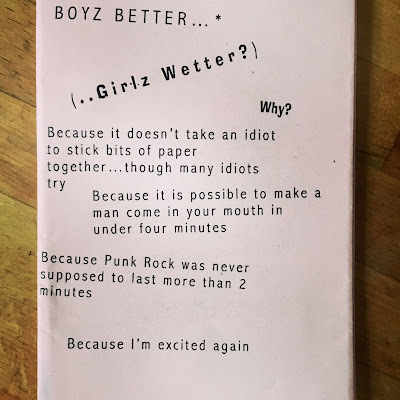 There’s a review of a gig by the Yeah Yeah Yeahs, an interview with Jef Steartfield of Plan A (me neither) and a rather NSFW 14-point “Guide to Being a Groupie”. And that’s your lot, as the back cover announces in no uncertain terms. The thing is, I have no memory of how I came into possession of this piece. At first I assumed I must have got hold of it in about 1997/8, when I spent a lot of time on the Camden gig circuit: it was hidden amidst a pile of compilation CDs from that era, boasting tracks by the likes of Dweeb, Midget and The Bigger The God. But the Yeah Yeah Yeahs reference pitches it forwards, to 2001 at the earliest. 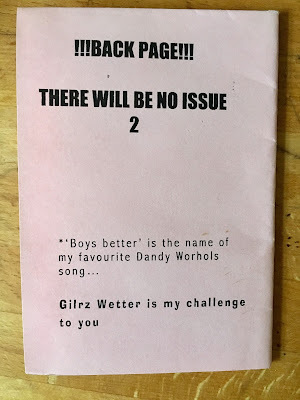 What’s interesting about that is that by then it would already have been something of a throwback, as the early rumblings of blogging and social media started to encroach of the turf of print zines. And what’s more, it makes no attempt to perform even those limited gestures of social interaction that print can offer. There’s no information about who the author may be, not even a pseudonym; no contact details, not even a good old analogue PO Box; it’s just there, in your face, make of it what you will. It’s entirely devoid of context, whether in itself or in terms of my own memories. 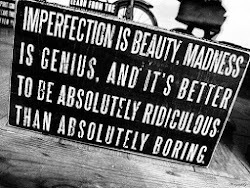 And there’s something rather magnificent about that. I’d be intrigued to know who created it, but at the same time, I quite like the state of ignorance in which I find myself.